From The North: Take Route 95 South. Take Exit 7A (Mansfield, Route 140 Souhth). Go to the sixth traffic light and take a left on School Street. Go 1/2 mile to lights and take a right on to West Street. Go 4/10 of a mile to lights and take a left on to North Main Street. The funeral home is one block up on the right. From The South: Take Route 95 North. Take Exit 6A (495 South, Cape Cod). Take Exit 12 (Mansfield, Route 140 Souhth). At the 1st Traffic Light take a right on School Street. Go 1/2 mile to lights and take a right on to West Street. Go 4/10 of a mile to lights and take a left on to North Main Street. 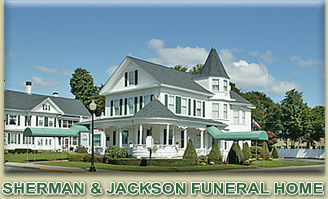 The funeral home is one block up on the right. From The West: Take Route 495 South. Take Exit 6A (495 South, Cape Cod). Take Exit 12 (Mansfield, Route 140 Souhth). At the 1st Traffic Light take a right on School Street. Go 1/2 mile to lights and take a right on to West Street. Go 4/10 of a mile to lights and take a left on to North Main Street. The funeral home is one block up on the right. From The East: Take Route 495 South. Take Exit 6A (495 South, Cape Cod). Take Exit 12 (Mansfield, Route 140 Souhth). At the 1st Traffic Light take a right on School Street. Go 1/2 mile to lights and take a right on to West Street. Go 4/10 of a mile to lights and take a left on to North Main Street. The funeral home is one block up on the right. Please Call 508-339-2000 If You Need Further Assistance.